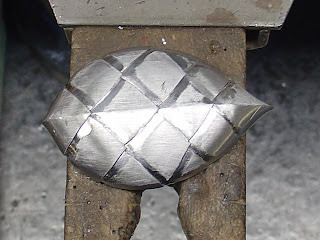 After the lines were marked and deepened with a file I started carving metal with a graver. 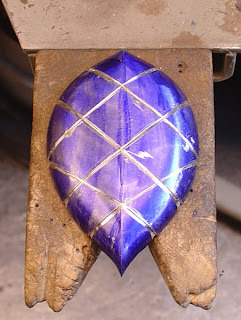 I use mostly flat gravers for this kind of work. 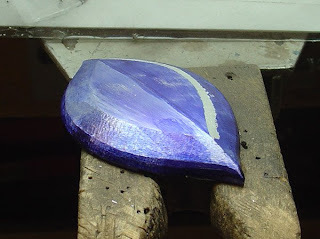 This is about as deep as I am going to carve, it didn't take long to get to this point, but there is a lot of polishing and refining left to do. Most of the time I spend on the piece will be doing that sort of thing. The piece is held with Jett Sett. This is the back of the piece. I am going to engrave something on the back, but I have not decided on the pattern yet. I will probably carve the same pattern that is on the front, but not as deep. 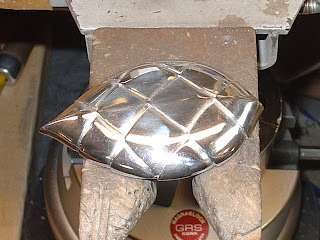 Looks finished in this photo, but there is still more refining to do around the edges of the scales. 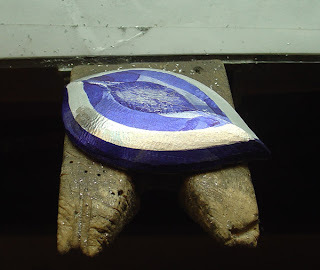 After the grinding I sand the whole piece with a small belt sander that attaches to my NSK E-max micromotor. I use tape sort of like a ruler to help mark where the lines will be. I use a scribe and lightly trace along the edge of the tape, then remove the tape and put on a new piece to mark the next line. All the lines have been marked. Without the layout fluid the lines would be much harder to see while I am working, and I doubt they would even show up in the photo. I filed along the lines tomake them deeper. I could have used a graver, but I think I am better with a file than a graver. 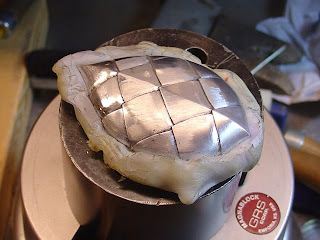 After I finished the outline of the piece I started grinding it to make it sort of domed. 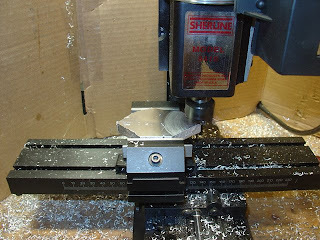 I use a rotary tool with 1/2" cylinder bur. The blue stuff that is on the piece in almost every photo is layout fluid. It makes scribed lines show up better, and afer I have done a lot of grinding it makes it easier to see what I am doing. I like to scribe lines around the piece and grind away one area at a time. The layout fluid makes it easier to see that I am staying the the area I designated to grind. In this photo I am almost finished. 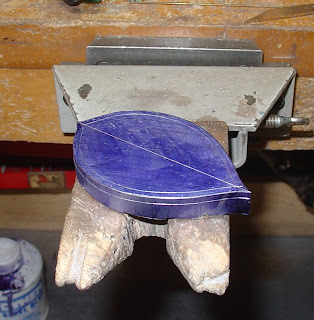 The next step is to lightly grind the piece all over and make sure is has a smooth contour. 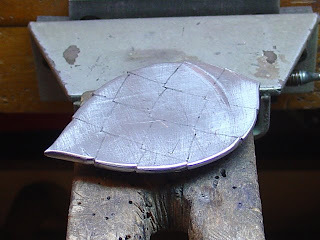 I started on a new brooch yesterday. 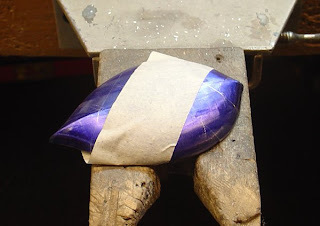 Currently I have at least 5 brooches in progress, including this new one. I started with 1/2" thick aluminum, and milled it down to about 3/8". 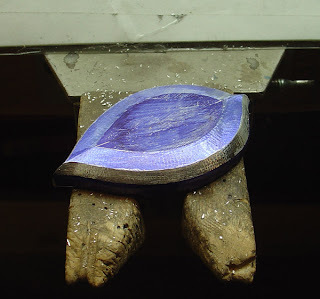 After I milled the metal to the right thickness I cut out the shape on the bandsaw and refined the shape with a belt grinder. 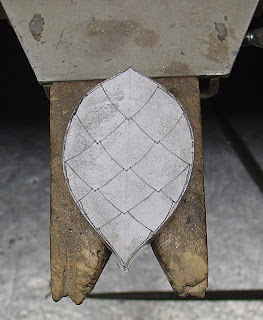 This is the pattern I will carve after I have the overall shape finished. 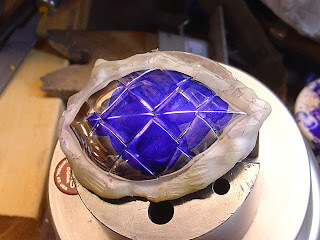 The piece will be sort of domed. Here I am about to start grinding it. This is where I am at right now. I will post more pics as I work on it. I haven't abandoned this blog, there's just nothing to write about. 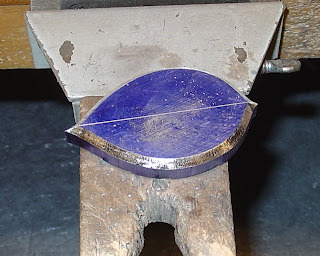 I have been working on my scale necklace a little, and I have some brooches I am working on. 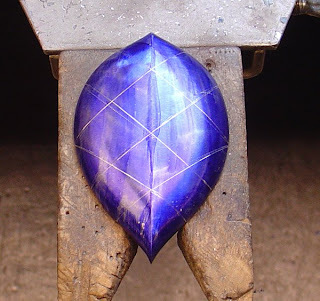 I had an idea for another brooch today, I should probably do a sketch before I forget. I got my pieces back from the exhibition Close to the Skin. I don't know anything about that exhibition. I don't know who was in it, aside from a few people I know. I didn't get a catalog, I didn't get a postcard. At least I got my work back.